Finding wedding reception centerpiece ideas that are realistic to your budget can be tricky, you know what you want but it is likely to cost a fortune. What do you do? Well, first think about your wedding theme and then have a look at these cheap wedding centerpiece pictures to get some ideas that would work for your wedding reception. Your centerpieces will be the added wow factor that you and your guests will see when they first walk into the room. With that in mind it is a good idea to think about the layout of the tables, the table linens and any other decorations that are in the room. 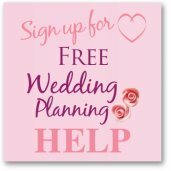 Have a chat with your wedding venue and see if you can view your room when it is set up for a wedding to get an idea of what will work. 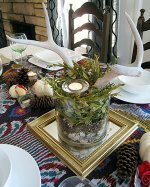 Now here comes the clever bit ... not every table has to have the same centerpiece, instead form a pattern where you maybe alternate the centerpieces. This way you could have a more expensive centerpiece with flowers on every other table and then candles and petals on the rest. Keep the overall theme the same throughout your wedding reception with the candles and petals matching the flowers on the other tables. 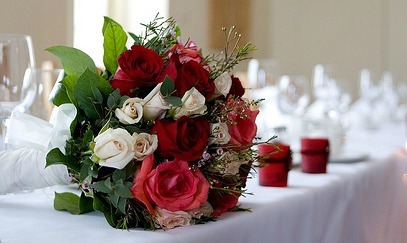 Use your centerpieces with the most impact on the tables near the entrance or where they will be seen the most. Quite a few brides will have a mixture of tall and more elaborate floral centerpieces and then smaller floral centerpieces as well. Your florist should be able to work with your wedding reception centerpiece ideas and make it look as if they are meant to be together, this wedding reception has this mixture and it looks great! Top tables don't need to have centerpieces, you can use your bridal bouquet and your bridesmaids flowers to decorate the table. You could have empty glass vases waiting for your flowers when you sit down and then to match with your theme have candles and petals dotted along the table. This will help bring the room's decorations together and stop any guests thinking that they are in the cheap seats! Also if you are having a traditional long top table and you are facing your guests then you could have the front of the table decorated instead. This could be strands of ivy (free) or even paper flowers (cheap). 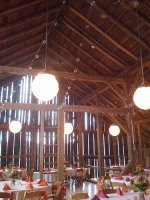 Head table wedding decoration ideas. 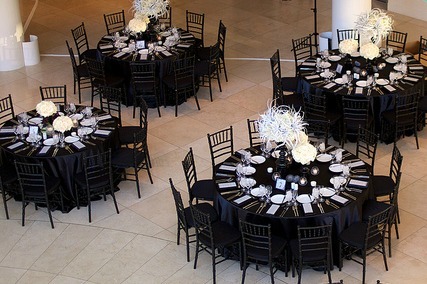 If your wedding reception has a very distinct theme then you could have each table with a different part of that theme but in keeping with the overall look. One couple loved to travel so they themed each reception table to one of their favorite places. Each table had a picture frame with a photo that they had taken there and a flag and candles. Another couple were very into their music so they named each table after a favorite artist, or it could be characters from a movie, there must be loads of other ideas that you could use. 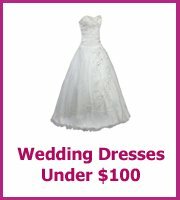 Using your wedding colors for the table decorations can also be inexpensive. I love the simplicity of these wedding tables and they are so easy to do yourself. 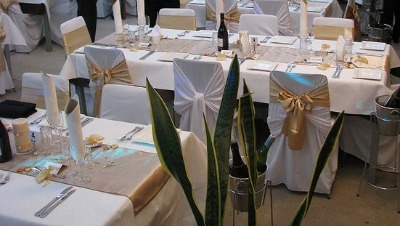 All you will need is gold tulle for the table runner which you can buy in a roll. And a pillar candle with a pretty plate to place it on. 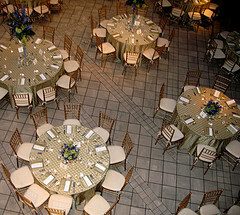 The extra gold on the table comes from the favor bags and the big gold bows on some of the chairs.